It is most popular in United States. 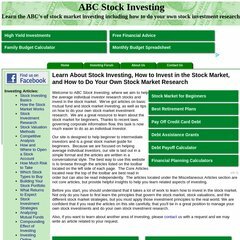 Topics: Favorites, Stock Investing Basics, How The Stock Market Works, Stock Investment Research, Stock Valuation Methods, and Competitive Analysis. Age: The domain is 13 years and 7 months old. The estimated 257 daily visitors, each view 1.30 pages on average. It is hosted by Pair Networks (Pennsylvania, Pittsburgh,) using Apache/2 web server. It has 2 DNS records, ns319.pair.com, and ns0000.ns0.com. Its IP Number is 216.92.155.247. PING (216.92.155.247) 56(84) bytes of data. A ping speed test response, is timed at 36.5 ms.